Better Buy: Ferrellgas Partners, L.P. vs. AltaGas Ltd.
With high yields, Ferrellgas and AltaGas are interesting investment options for income investors, but they aren't of equal quality. If you are looking for high-yield stocks, it's very likely that Ferrellgas Partners, L.P. (NYSE:FGP) and AltaGas Ltd. (NASDAQOTH:ATGFF) will be of interest to you, sporting impressive yields of 12% and 8.3%, respectively. Often a higher yield is a good thing, but in this situation, you are probably better off going with the lower, though still robust, yield offered by AltaGas. Here's why. Ferrellgas is one of the largest propane partnerships in the United States. This is a fairly stable business in which Ferrellgas gets paid for delivering propane, with often-volatile propane prices simply passed through to customers. Bolt-on acquisitions are important because they help offset the natural attrition in the industry from customers shifting to alternative energy sources for home heating. Weather is the biggest determinant of demand, which has been a headwind in recent years, but that was more favorable this past heating season than it has been in many years. Ultimately, this part of Ferrellgas is doing just fine, all things considered. However, in 2014, Ferrellgas decided to use its core propane business to expand into the midstream oil and gas sector. That led to a huge increase in the limited partnership's long-term debt from roughly $1.1 billion at the end of 2013 to around $2 billion at the end of 2017. This wouldn't have been a huge deal if Ferrellgas hadn't lost a key midstream customer during the deep energy downturn that started in mid-2014. Revenues in this segment plummeted a painful 25% in fiscal 2017. The headwinds in this business led Ferrellgas to cut its distribution and take a large write-off, pushing unitholder equity into negative territory. It is working to turn things around, recently selling off one of the risker pieces of its oil and gas midstream operation, but progress has yet to show up on the balance sheet. Most investors should probably avoid this high-yield stock until debt levels start to come back down. AltaGas is a diversified Canadian utility with operations in the utility, midstream, and merchant power sectors. It recently made a large acquisition, adding U.S. natural gas utility WGL Holdings to its portfolio in July of 2018. After that deal, however, it doesn't look nearly as Canadian as before, with EBITDA generated roughly 50/50 between Canada and the United States. The WGL deal was expensive, with AltaGas now looking to integrate its new assets and, equally important, sell off noncore assets to help pay for the $8.4 billion (in Canadian dollars) deal, which includes WGL's debt. It's targeting asset sales of $1 billion CAD in 2018, with a final goal of nearly $2 billion CAD before it's done. Longer term, however, it expects the deal to help push its earnings growth up from a historical range of 7% to 9% to a new range of 8% to 10% through 2021. Dividends, which are paid monthly, are expected to grow 8% to 10%, too. This is all very exciting, especially when you combine it with a more than 8% yield (note that the dollar value of the dividends U.S. investors receive will fluctuate based on exchange rates). But it was mergers and acquisitions that got Ferrellgas into trouble. What's different about AltaGas? Notably, AltaGas's business was already diversified before the WGL merger, so it has expertise in the fields it entered. And AltaGas, even after the merger, is a fairly conservatively financed company. It has an investment-grade credit rating and is targeting a dividend payout ratio of 50% to 60%, with 85% of the dividend covered by its regulated utility business. This is a vastly different, and far more stable and secure, story than what is transpiring at Ferrellgas Partners. If you are looking for a high-yield energy play, it's worth your time and effort to get to know diversified and high-yielding North American energy company AltaGas. There's really not much comparison here once you look past the high yields offered by both Ferrellgas and AltaGas. While Ferrellgas could be a fine choice for investors who like turnaround situations, it is best avoided by most investors until that turnaround is further along. 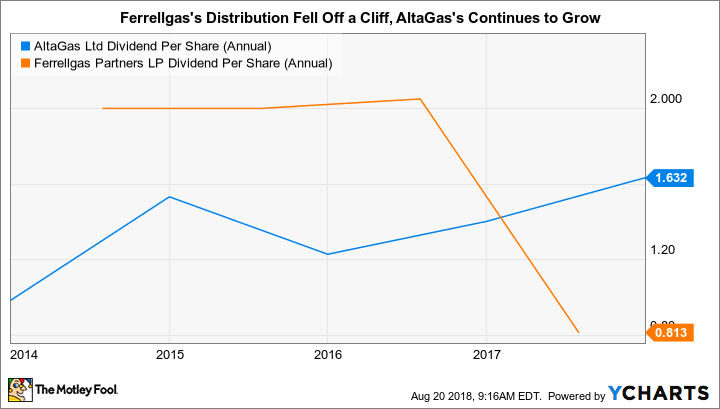 AltaGas, meanwhile, is simply playing out a relatively conservative game plan that has long rewarded investors with growing earnings and dividends. The WGL merger is new, but it doesn't look likely to derail AltaGas's long-term track record. Now is a good time for a deep dive.